A cramped workspace can make it difficult to find what you need, distracting you from business at hand. Excess inventory, samples, supplies and paperwork tend to pile up quickly in small spaces, requiring extra effort to keep things organized. You may have considered renting additional commercial space or trying to squeeze more room in your home-based office, but were put off by the cost and loss of valuable time to planning and construction. That’s why, for today’s businessperson, self-storage is a cost effective and efficient solution. At Global Self Storage, we find that most of our business owners make use of self-storage not just for long-term, but also short-term solutions. Storing seasonal furnishings such as patio furniture, grills, outdoor kiosks, etc. Tip #1: Make a list of all of the items you’ll be storing in your unit, and keep an ongoing inventory. Based on this list, you can then determine the amount of space you will need. With proper packing and organization you can fit a lot more in a Global Self Storage climate-controlled or standard unit than may appear. The Global Self Storage on-site manager is an expert at this, and will work with you to ensure that you’re choosing the size you need. It’s easy to forget over time what you’ve taken out or added to your storage space, especially if several employees frequently access the unit. Consider keeping a running inventory on a PDA, laptop or website in order to keep tabs on stored items whether you’re at the unit or your office. This is valuable information not only for staying organized, but for insuring the items you’re storing. Global Self Storage climate-control units maintain a steady temperature of between 50–80° using central air conditioning and heat. Maintaining a steady environment prevents warping, rust, yellowing, mold, and infestation of vermin. 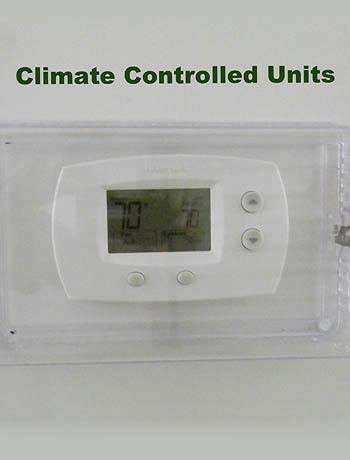 If you’re going to store computers or computer parts, climate control is a must. The same goes for sensitive equipment, important paperwork, pharmaceutical samples, furniture, or anything else that may be damaged by extreme heat or cold. It also provides a pleasant temperature while you are retrieving or organizing your stored belongings. In most cases there is an additional cost for climate control; however, it is ultimately an excellent return on investment in loss protection. Tip #3: Proper packing is key. Although Global Self Storage climate-controlled and standard units are intended to protect your belongings from the elements, additional steps should be taken to protect the items you are storing, especially if they are of high value. Computers should ideally be put in a box and then packed securely with packing peanuts or some other type of foam insulation. Office furniture can be turned on end vertically.